A while back I saw a video of a lure that put me in awe. The lure is made from Think Tank Lures and it is called the triggerfish. I knew I had to get my hands on this lure. The issue was that they were still in development. 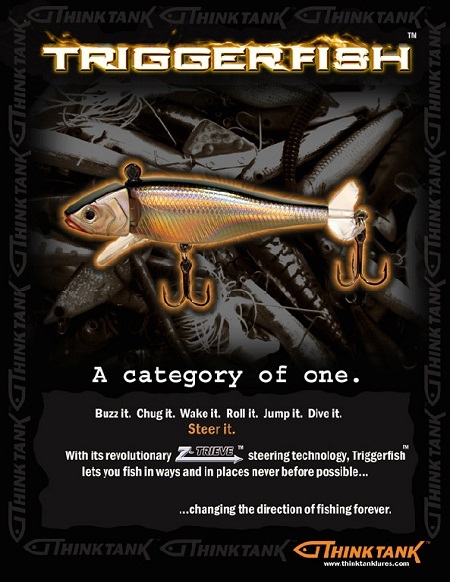 Well, today I got an email from Ian Scott the president of Think Tank lures letting me know that they are now available. If this is not a lure to have in your arsenal, then no lure is. Imagine being able to control this lure around trees, brush and what not. Take a minute to watch the video and you will see what i mean. I am ordering a few, so dont be surprised if you have a chance to win one.